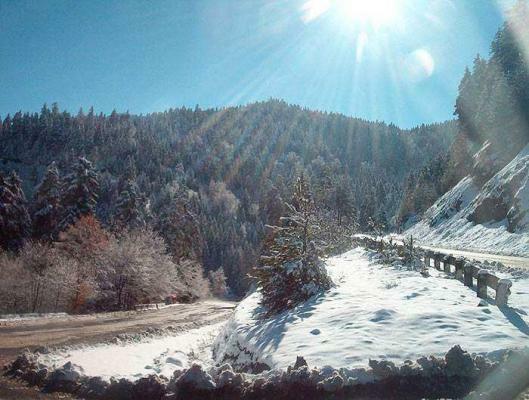 Skiing resort Bakuriani is located in Borjomi, one of the most beautiful gorges of Georgia. It is built on the northern slopes of Trialeti Range (Small Caucasioni) at an elevation of 1.700 meters above sea level. Amazingly rich natural conditions have made the place famous still back in XIX century. Story of the resort takes in start in 1876. First came Ukrainians later joined by people of various nationalities, therefore, turning Bakuriani into multi-national settlement. The first residents were mainly engaged in wood processing that would be then sent to Germany and used for making musical instruments. To make the transportation simpler, a railway of narrow tracks was built in 1902 linking Borjomi and Bakuriani. Such railway is the only one in Georgia, which has been supplied by electricity since 1962. The railway is still operating and does not lack the passengers the first cause of which is the marvelous landscape seen from an open small steam locomotive (so-called â€œKukushkaâ€). Bakuriani is recognized for its location. It is surrounded by mountains from all sides covered by coniferous forests (mainly made up of spruce, pine-tree, Chinese navy blue fir and other). Coniferous forests make the air crystal fresh. There are alpine slopes above the forests. World-known unique mineral waters of Borjomi take their origin in here. Bakuriani always drew attention as a wonderful resort. Back in the XIX century, it was the most appreciated place for Russian royalty to have a rest. Since 30s of theXX century, it has been officially awarded the status of a resort. In Soviet times, Bakuriani was a traditional place for winter sports contests (slalom, bobsleigh, biathlon, ski jumping and other). In 70-80s, there was a main base for the Soviet Olympic skiers here where all legendary Soviet skiers exercised. The unique and characteristic climate is the cause of resortâ€™s location in sub-tropical zone at a comparative height. Summers are relatively cool (average temperature in August +14ÂºC). By the end of September it starts freezing. Winters are moderate (average temperature in January is -5-6ÂºC). The depth of snow is 60 cm on average. Duration of sunshine exceeds 2000 hours a year. Dry mountainous air filled with fragnance of coniferous forests as well as huge amount of solar radiation creates favorable conditions for effective climatic therapy of those suffering. To spend holidays in Bakuriani is favorable not only for health but it gives an opportunity to spend unforgettable and beautiful days to recall and remember for many years ahead. If you consider that number of big and small hotels in Bakuriani offer diversified services, you should agree that visiting Bakuriani once again is worthwhile.